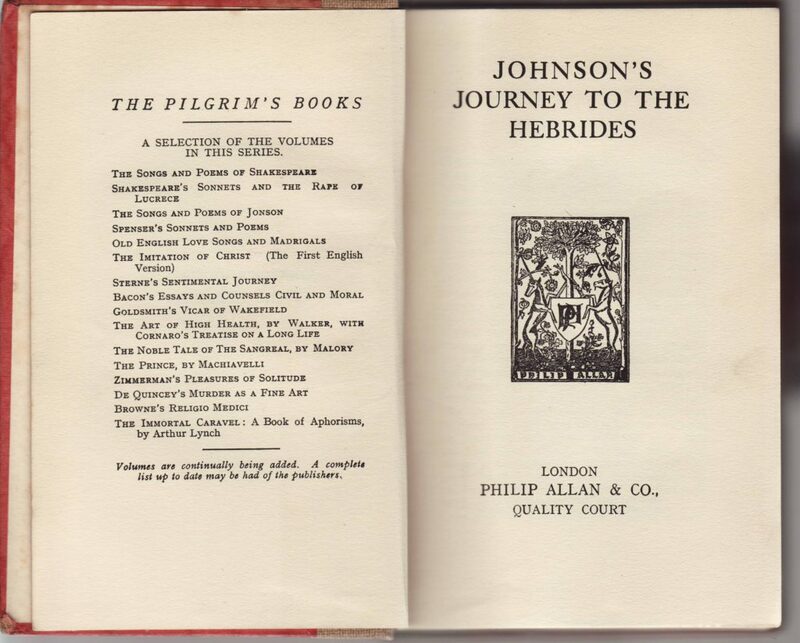 The first title in the Philip Allan & Co. series of reprints called the Pilgrim’s Books was issued in 1919, announced in The Bookman (1919, vol. 57, p. 97) as shown in the advertisement to the right. The ad includes, near the bottom, The Pleasures of Solitude by Johann Georg Zimmerman, #1 in the series. 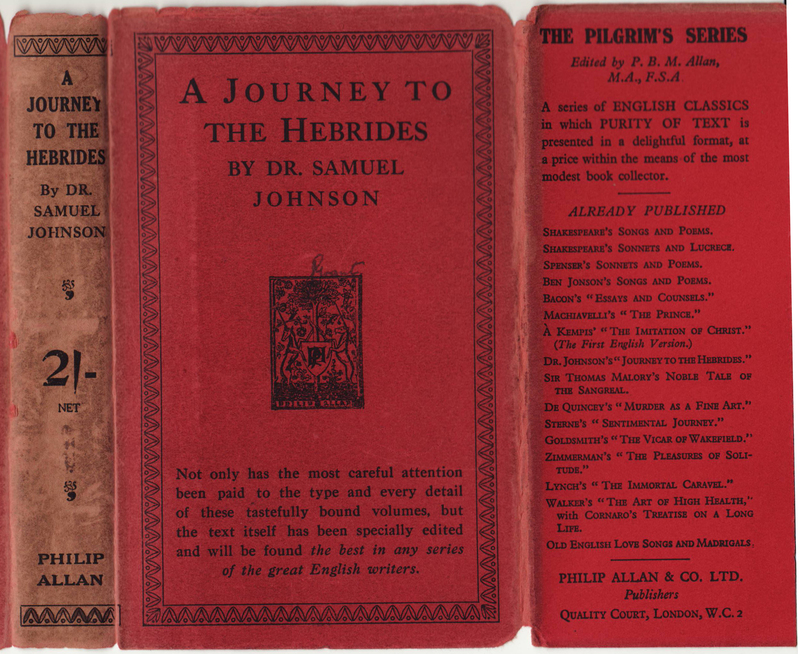 The “Pilgrim” in the series name undoubtedly suggests that the portable nature of the book makes them suitable for travelers. It is also clear that the series name is the Pilgrim’s Books. That series name is used in the book itself (see below) and all of the advertising for the series. Alas, dust jackets for the series call it the Pilgrim’s Series, several times, in fact. This discrepancy is a bit strange, given that the books are above average in quality and the dust jacket alludes to the careful editing of books in the series. 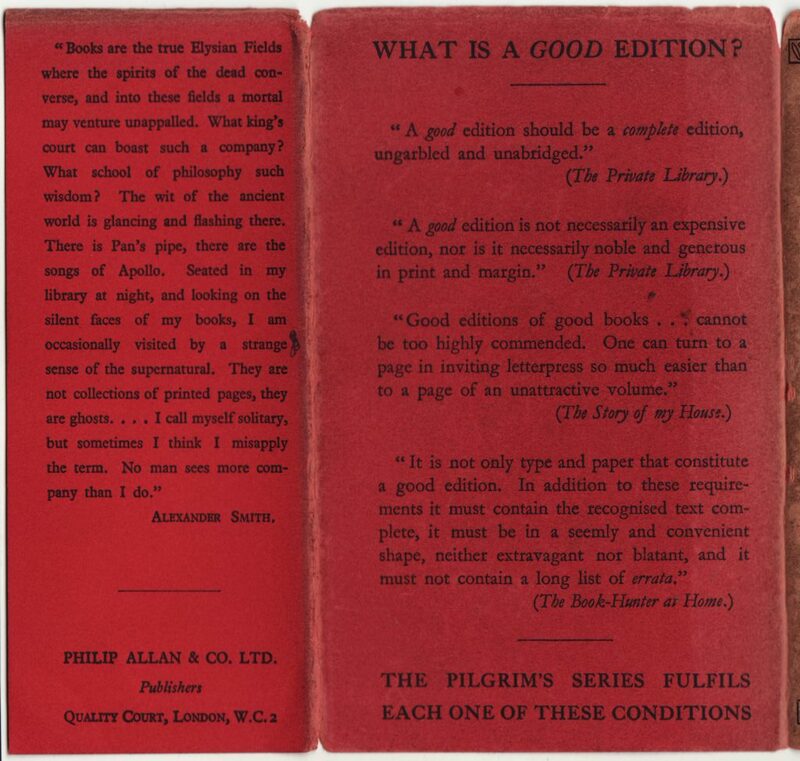 The advertisement indicates the Pilgrim’s Books cost 5s. each. This price would drop to 2s. by the mid-1920s (see below). Philip Allan & Co. issued the series in two parts. The first five titles were numbered and issued in 1919 (1 title) and 1920 (4 additional titles). The cost was 5s. There is a break until 1924 when 7 new titles are issued (and at least 4 of the first 5 titles are reissued with a second edition indicator). 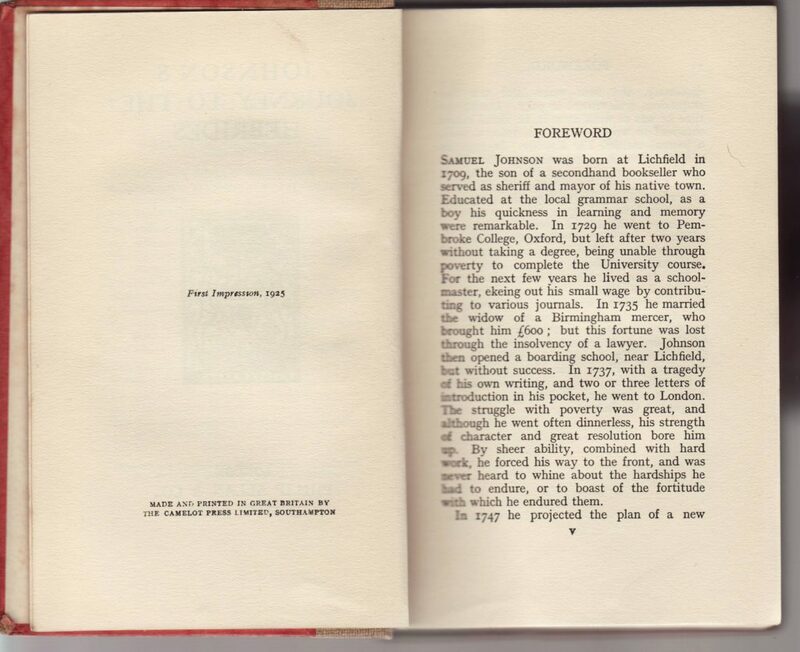 In 1925 4 new titles are issued, and in 1926, the last new volume in the series. The cost for these latter titles was 2s. I can’t find any subsequent reprintings. It is possible that the bindings and jackets for the 1919-1920 era series differed from those issued 1924-1926 (I have not seen an image of one of the earlier books with or without the jacket). 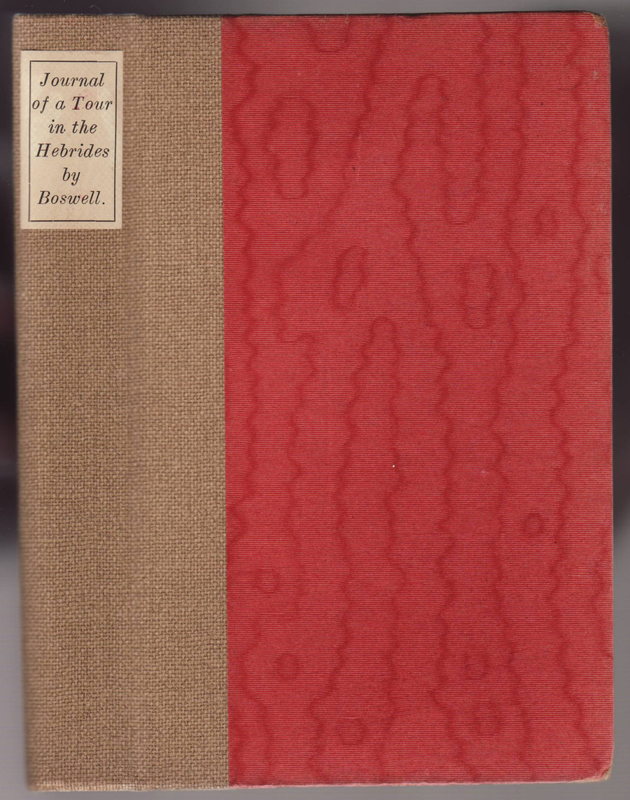 Jackets for the series, at least in the 1924-1926 era, are common in design from book to book. 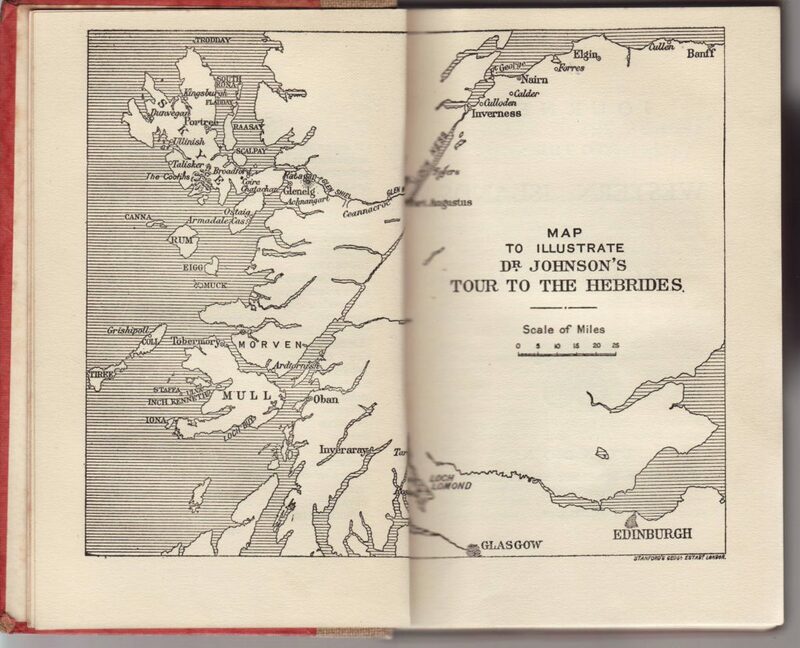 Johnson’s A Journey to the Hebrides was first included in the series in 1925. A decorative border is included at the top and bottom of the jacket spine, along with the price of 2s. net. This was down from the 5s. per title cost of the series from 1919-1920. The jacket front includes a blurb about the series (“the best in any series of the great English writers.”). The publisher’s colophon is also centered on the front of the jacket. The front jacket flap uses the incorrect series name and includes the editor of the series, P.B.M Allan. Sixteen titles are listed in the series. One more would be added in 1926 for a total of 17 titles in the series. (#2) Sir Richard Steele & Joseph Addison Toasts, Rakes and Cits. * not listed on the jacket or in the book A Journey to the Hebrides above. The books themselves have a quarter binding with a coarse, burlap type of cloth on the spine and patterned paper over boards on the remainder of the covers. The book title and author are on a piece of paper glued to the spine. There is no other typography on the book spine. 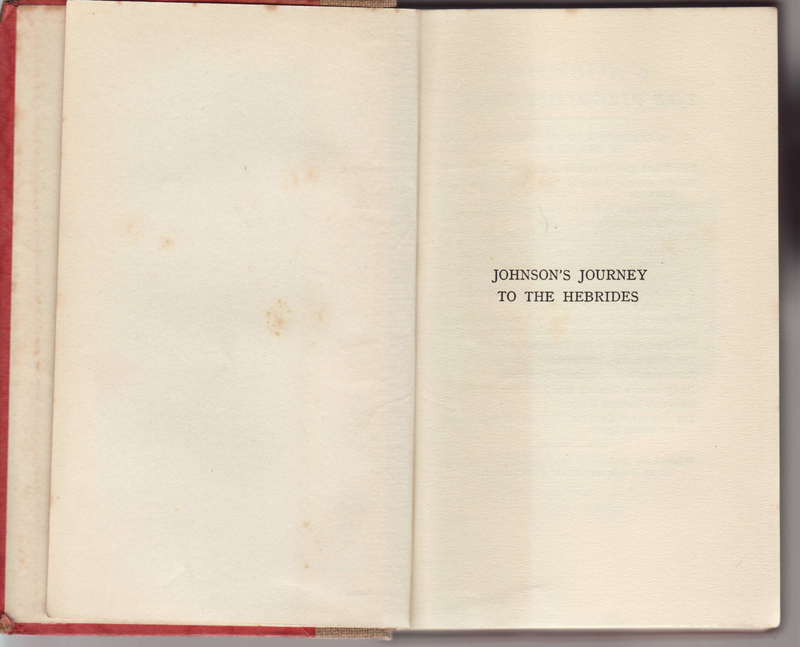 The title page, faced with a list of the Pilgrim’s Books: the only place the series name is included in the book itself. 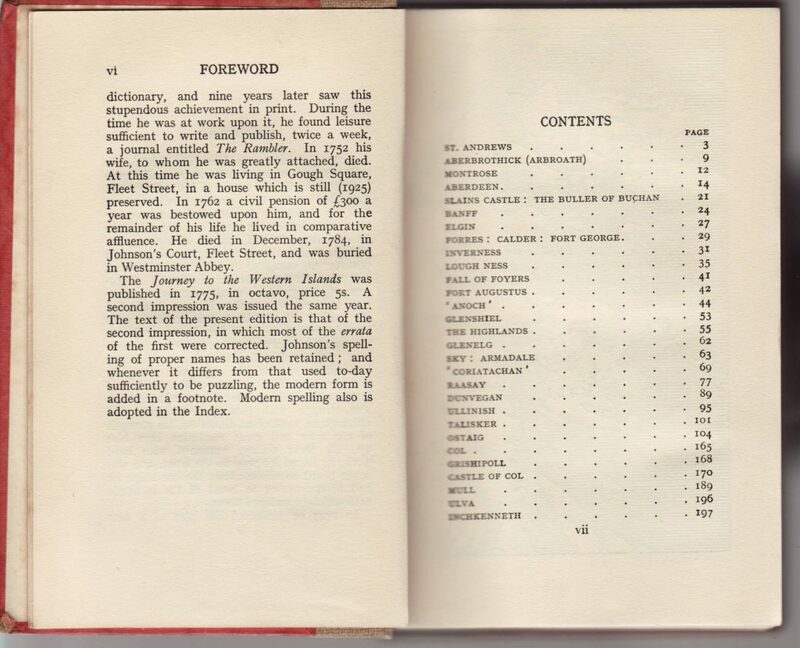 “First Impression, 1925” along with the printer (The Camelot Press) is included on the copyright page. 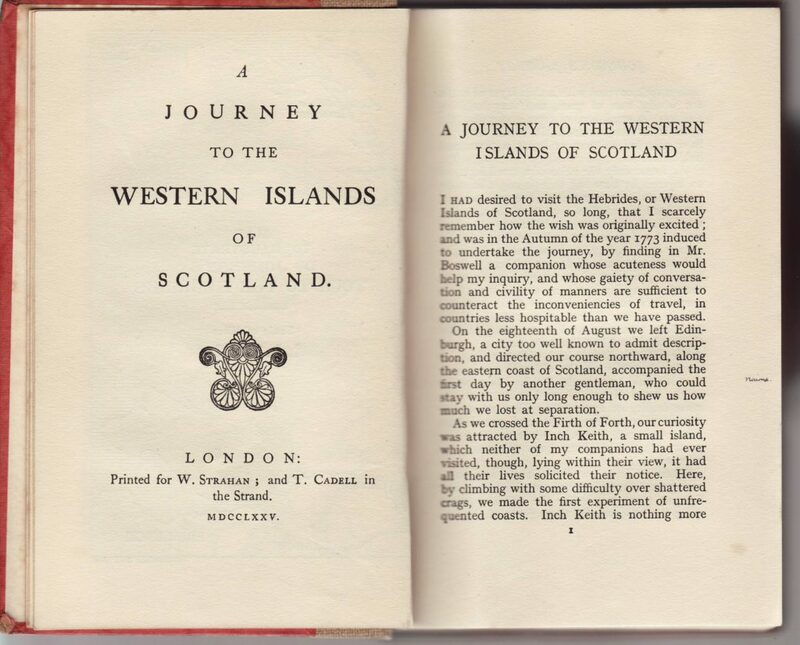 A facsimile of the original title page for Johnson’s A Journey to the Western Islands of Scotland faces the first page of text.